CATALYST AUDIO Catalyst Audio Model 110 Quad Gate Module (B STOCK) vinyl at Juno Records. 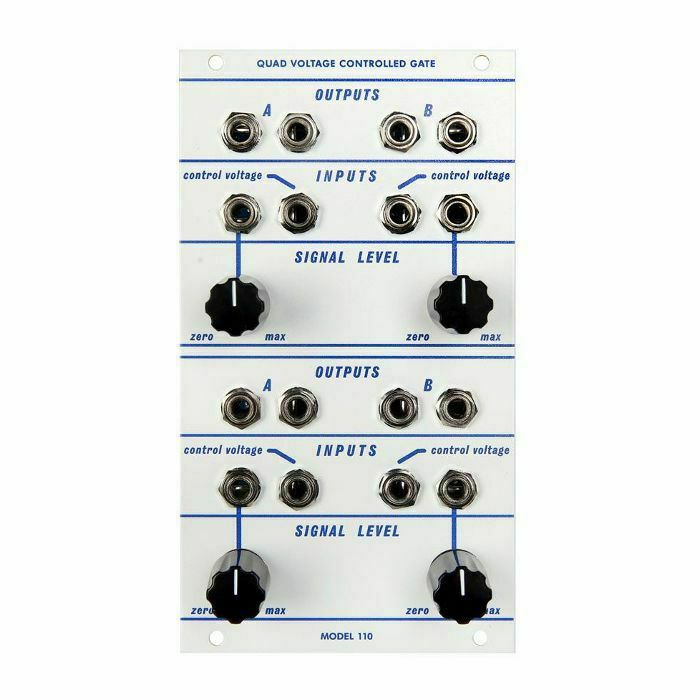 With the Model 110 Quad Gate, musicians can add the distinctive sounding, nonlinear VCAs of the Buchla 100 series to their Eurorack synthesizers. The circuits are controlled via potentiometers and CV inputs. The VCAs' response characteristic is exponential in the first third of their control range. In the second third, the response characteristic changes to linear and finally to logarithmic behaviour. Additionally, some saturation is applied at the upper edge of the control range. The Model 110 Quad Gate does not feature vactrols. Thanks to its ultrafast response time, the module is a great partner for creating percussive sounds. Furthermore, the Model 110 is able to perform amplitude modulation at audio rates.